Winnipeg Jets fans are crossing their fingers and offering up encouragement to their team as it looks to battle back against the St. Louis Blues. “We have your backs. 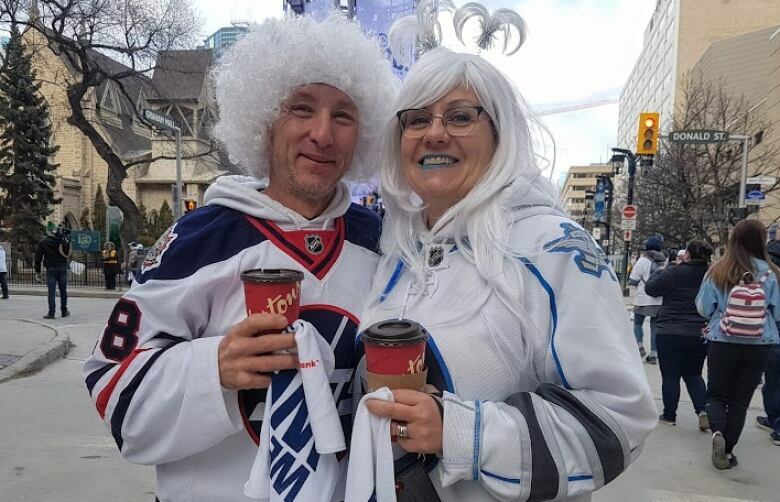 We’re here to support you,” said Michelle Gingras, who was among the first people to enter the Whiteout street party outside Bell MTS Place on a chilly evening just above the freezing mark. The Jets lost Game 1 of the best-of-seven first round Stanley Cup playoff series 2-1 on Wednesday, after leading 1-0 entering the third period. 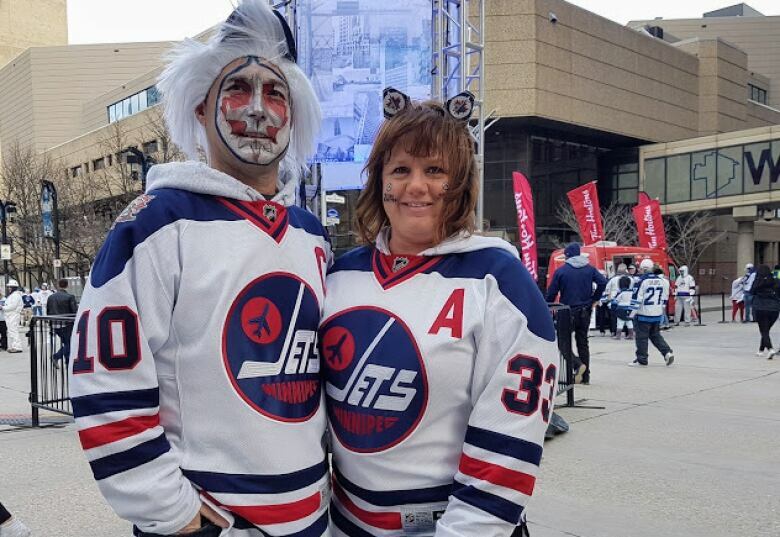 Jets season-ticket holders Mike and Debbie Renaud, outfitted in full Whiteout gear, say the formula for the Jets is straightforward. “Have some fun and just go out there and play the way we know the Jets can play,” added Debbie. Not only is the home team down 1-0 in the series against St. Louis, they face some steep odds. In five previous Game 2s in franchise history, the Jets have only won once. On top of that, the team is in a playoff scoring drought. They have only managed to score one goal in each of the past three playoff home games, dating back to last season. The last time they scored multiple goals in a home playoff game was Game 1 of the Western Conference final last season when they beat the Vegas Golden Knights 4-2. “It’s their day today,” added Gingras. Jets captain Blake Wheeler made it clear to reporters on Thursday that the 1-0 series deficit was not going to devastate the team. “Who’s the last team to go 16-0 in the playoffs? Has that ever happened?” he asked the media throng when questioned about his reaction to dropping Game 1. Wheeler was referring to the number of wins it takes from the start of the post-season to hoist the cup as champions. “We didn’t expect to do that [go undefeated],” he said. He noted the Tampa Bay Lightning, who tied the NHL record for regular-season wins this year and finished first in the league, held a 3-0 lead after the first period in their Game 1 on Wednesday. They collapsed and lost 4-3 to the Columbus Blue Jackets, who finished 13th — 30 points behind the Lightning. The Jets-Blues series shifts to the Enterprise Center in St. Louis for Game 3 on Sunday and Game 4 on Tuesday. The Jets were 26-5-4 during the 2018-19 regular season when leading after the second period, tied with the Florida Panthers for the most losses in the NHL. The Jets had one of the best home records in the NHL during this past regular season at 25-12-4. Last season in the playoffs, the Jets went 5-3 on home ice, including winning their first four home games. Jets goalie Connor Hellebuyck has allowed three goals or fewer in 10 consecutive playoff starts dating back to last season. Despite a 3-7-0 record, he has a 2.34 goals-against average and .923 save percentage in those 10 games, during which the Jets have been outscored 23-25. Defenceman Dustin Byfuglien is the only player on the Jets roster to score an overtime goal in the Stanley Cup playoffs and that happened nearly a decade ago. He did it while playing for the Chicago Blackhawks in Game 3 of the Western Conference final against the San Jose Sharks. The Jets franchise has never won a playoff game in overtime, going 0-2 so far.